Of all the ways to play using motion-detecting video games, swordplay seems to offer the most potential for fun. The give and take of fencing and Kendo seem like easy rules to mimic in a video game and the slashing motion of using your sword to attack and block seem like the sort of big movements that would be easy to detect and track. Swords for the Wii, it seems, proves all of that wrong. The Brevity: I wasted a bit more than an hour of my life playing through this game. I spent much less time coming to the realization with my son that multiplayer managed to somehow be less enjoyable than the single-player campaign. Not time well spent, but at least it was short. The Controls: This is waggle at its worst; which is surprising considering the game makes use of the Wii's MotionPlus add-on for the remote. Despite this extra bit of motion-sensing refinery, I found the game completely misjudging movements. The Opponents: Swords random collection of generic bad men and women lives up to the game's flat title. The game feels packed with a collection of video game character rejects. 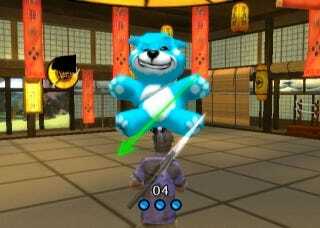 The Mini-Games: The mini-games, shoehorned between the "gameplay" of beating down opponents, is nonsensical at best, requiring you to hack up logs, slash flying teddy bears and play Simon Says with a sword. The Graphics: The canned animations and absurd damage modeling go hand-in-hand with the quality of the rest of this game. The Multiplayer: Single player required blocking everything an opponent threw at you in the hopes that you could get a perfect parry and be allowed to land a counter-attack. As annoying as that was, the multiplayer tossed that out the window in favor of a "who can wave their remote around fastest" style of game play that even bored my 9-year-old half a round in. There are plenty of relatively complex, and often delightful ways to try your hand at motion-based video game swordplay. This is not one of them. It doesn't get close to the complexity and graphics of The Playstation Move's Gladiator Duel on Sports Champions. And the pure timing and playful take on Kendo found in Wii Sports Resort is spectacular compared to the confounding swiping of Swords. If you're looking for a stand-alone swordplay game for the Wii this year, this is most certainly not it. Swords was developed by Panic Button and published by Majesco for the Wii on Sept. 14. Retails for $29.99 USD. A copy of the game was given to us by the publisher for reviewing purposes. Played all game types in both single and multiplayer modes.